The CS6MX-i is one of C.Scope's newest metal detectors, providing a high level of metal detector functionality with excellent performance, yet ease of use, making this detector ideal for the serious hobbyist as well as newcomer who wants a machine that will meet future needs too. The CS6MX is powerful enough to find difficult-tofind artifacts and will not need to be upgraded if interest in the hobby grows. The "i" in the product name stands for "interchangeable" as alternative search coils can be fitted to this detector. 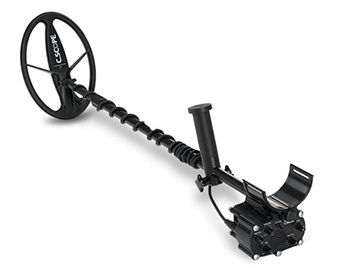 The CS6MX is a high performance specialist metal detector operating on the ‘MOTION’ principle. This means that the search-head must be kept moving at a steady sweep speed to achieve optimum performance. The 6MX features multiple discrimination allowing the user to detect the smallest and thinnest coins on the most heavily contaminated or mineralised sites. Rotary control switches the detector on/off and adjusts the sensitivity. Ground containing mineralisation and some beach situations may cause instability or false signals requiring a reduction of the sensitivity level. Start off with this set to AUTO. Extra sensitivity can be achieved on consistent ground by adjusting this control manually in conjunction with the sensitivity control.